I was a peace-time soldier, a conscripted National Service man being trained to fight a war which, fortunately, did not happen in my service. 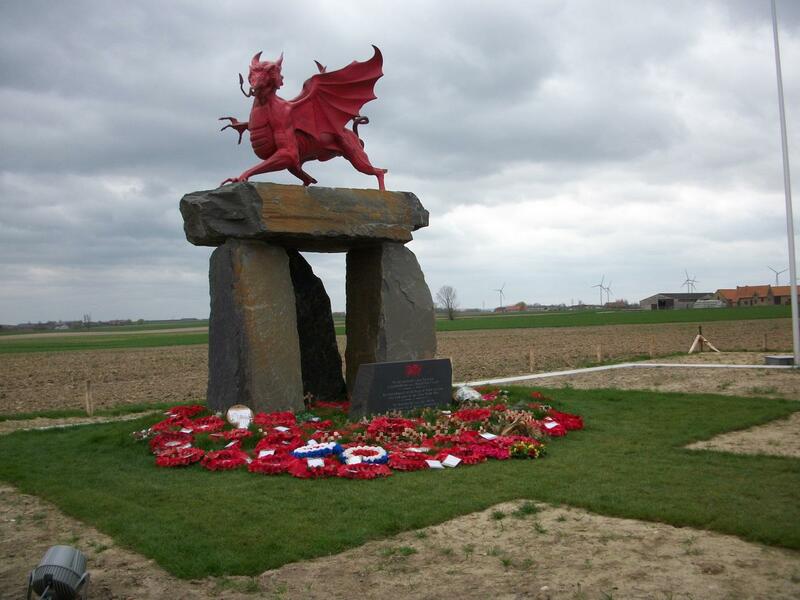 I had stood at the start line before dawn waiting on the order to advance to attack: even though it was a training exercise, the adrenalin and the fear of the unknown still sprang to mind, more particularly because I was looking at the memorial to the Welsh dead at Mametz wood in Belgium. The memorial overlooked the field facing the wood where the German army lay in wait for them. The Welsh division had been ordered to attack and were ordered to walk across the open ground to take the wood. Did those who gave the order know that the edge of the wood was lined with machine gun nests? 4000 Welsh soldiers were killed or wounded in the attack. Like so many of the battles fought during the First World War the loss of life was horrendous. Brenda and I had joined a bus trip to Lille in France organised by Flintshire War Memorials Society. The purpose of the trip was to remember those killed in the First World War but particularly those who came from Flintshire. We were delighted to discover that apart from our friends John and Margaret Davies, who had asked us to accompany them on this trip, we knew three other couples including Lorraine and John Blythin from the parish. The organisers had done a great deal of research and had a list of Flintshire soldiers who had not returned. It was proposed that the graves should be identified and a small cross with a poppy be placed at each grave. They had identified the names of over 90 Flintshire men and we visited 8 cemeteries where we believed the graves were. It did not appear to be a difficult task until we stood in the first cemetery at Lijssenhoek and saw hundreds of identical white grave stones in neat rows, each with an inscription setting out the name age and regiment. As I wandered down the rows I saw memorial stones for soldiers of the Gordon Highlanders, the regiment which my father had joined in 1916, interposed with stones for soldiers of the Duke of Wellington’s Regiment, the regiment in which I served my period of National Service. The members of the society found and marked graves they knew were in this cemetery. There was a visitor centre adjacent to the cemetery exhibiting bits and pieces found on the battlefields or left at the casualty clearing station which adjoined the area of the cemetery. The simplicity of the displays and the everyday items on show labelled with the location etc gave a feeling of the reality of the deaths and the horrors of warfare. We visited The Artillery Wood Cemetery and paid homage not only to Flintshire soldiers but also at the grave of Ellis Humphrey Evans, who after his death was, as Hedd Wyn, awarded the Bardic Chair at the 1917 Eisteddford held in Birkenhead. His winning poem was recited at his graveside by one of the organisers of the trip. The overall death toll must have run into millions. At Ypres we went to the Menin Gate to watch the ceremony of the Last Post, which has been performed every night since the Great War. I was very lucky, as it turned out. 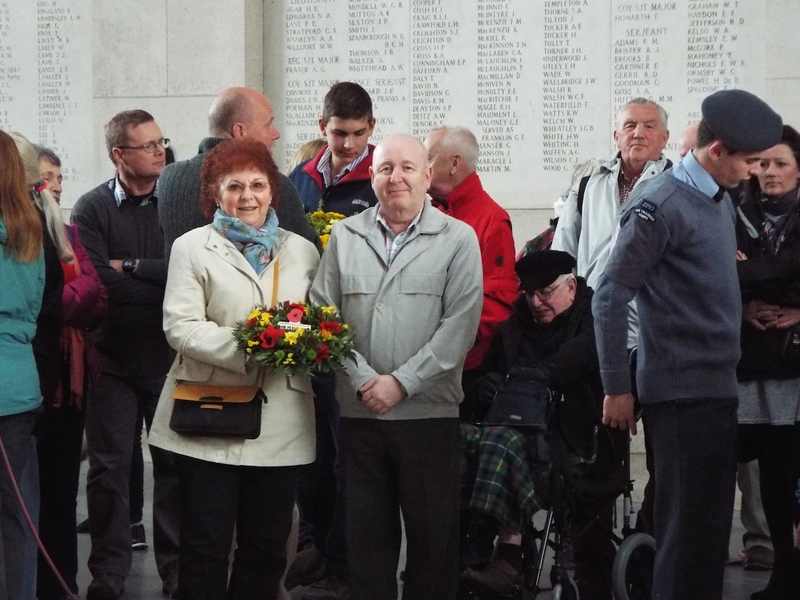 I was in a wheel chair, and various members of the party assisted Brenda by pushing me round to see the sights and to get a meal before the ceremony, before we all went back to the Menin Gate for the Last Post at 8 p.m. There was a tremendous crowd standing in four sections, two on either side of the roadway, but under the Menin Gate, a section was roped off to allow passage for those who were to lay wreaths to march across the road. I was in the middle, opposite the point where the wreaths were to be laid and was allowed, with my carer, unfortunately not Brenda at this time, to go to the front inside the roped-off area, and had an unobstructed view of the whole ceremony. After the Last Post was sounded by the buglers, who were led out by a piper, a choir from the Midlands sang several anthems while the wreaths were laid by military and naval representatives, scout groups, our group and others, some from New Zealand. Each pair of representatives marched across the road from the point where I was seated to the stand set up at the top of a broad stone stairway. The whole ceremony was very moving. After the wreath laying the piper played a lament as the buglers were marched off. We returned to our hotel in the evening for a pleasant meal and Welsh songs sung by three North Wales choir members who were with our group. We returned to Flintshire the following morning. 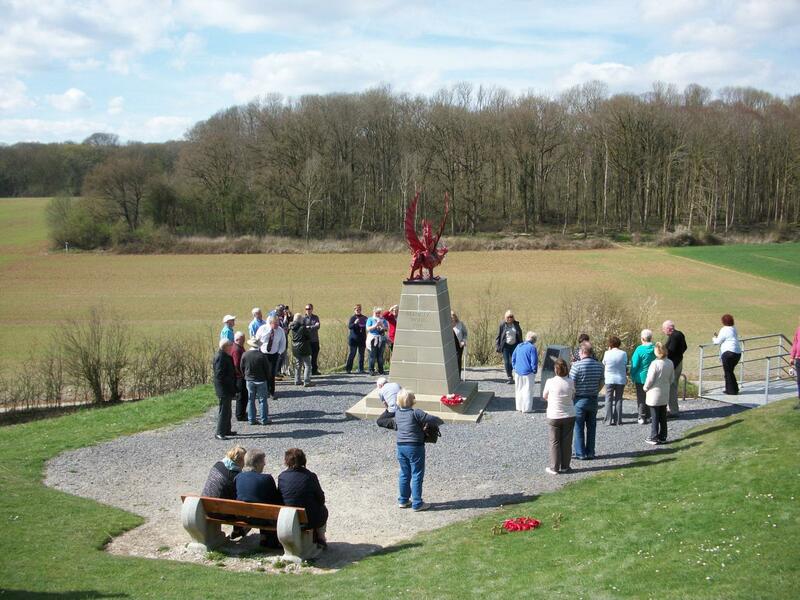 The trip had been organised by the Flintshire War Memorials society who used Jones Motor Services. We owe a big thank you to the organisers, as It was a most enjoyable and comfortable trip. It was a timely reminder of the tremendous loss of life by those who volunteered and fought for us in the Great War.